Glass bead blasting is one of the widely used surface blasting processes for smoothing, shaping and cleaning the surface of stainless steel castings. Glass bead is one of a variety of medias that we can do sand blasting with. Some buyers may mix this type of sand casting method, so below we will introduce this surface treatment in detail. Bead blasting is the process of removing surface deposits by applying fine glass beads at a high pressure without damaging the surface. It is used to clean calcium deposits from pool tiles or any other surfaces, remove embedded fungus, and brighten grout color. Glass beads can be safe compared to other blast medias. In particular, glass bead blast media can be a good alternative to silica sand depending on your application, which while silica sand is still legal it is becoming more regulated and is recognized as a source of a variety of health problems including silicosis. For more on silica sand and sandblasting check out this in depth guide. Additional benefits of glass bead blasting include that you can use them for a few cycles before they no longer clean a surface. It is common for glass bead media to last 4 – 6 cycles before needing to be replaced. Finally, glass beads can be used in a suction or pressure blast cabinet. This makes it versatile and can help offer a blast cleaning media that keeps your blast cabinet costs down (suction feed cabinets are more affordable than pressure feed). Knowing the benefits of glass beads, it is also good to know the common uses for glass bead blasting. Glass bead blasting is well suited for use in sandblast cabinets where blast media will be recovered. It is effective at cleaning a stainless steel casting surface without leaving much of a blast profile. This makes it ideal for cleaning paint or coatings off a stainless steel part. Main advantage of glass bead blasting over traditional shot blasting is that, it can provide finer blasting surface, but higher cost. So unless there is a higher demand on the surface finish, to be more cost effective, shot blasting is preferred. 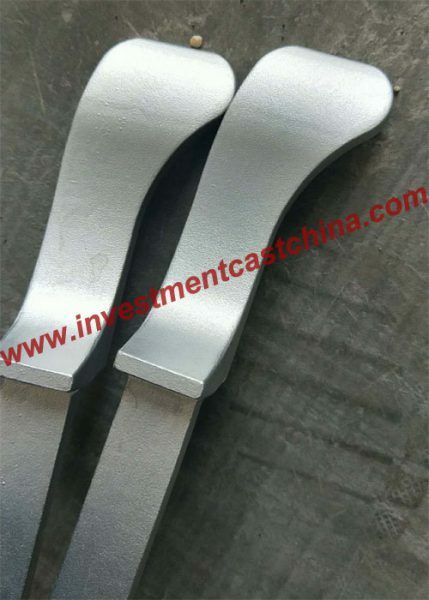 CFS Stainless Steel Foundry can deal with all kinds of stainless steel castings with glass bead blasting surface. If you have such demand, pls get in touch with us!